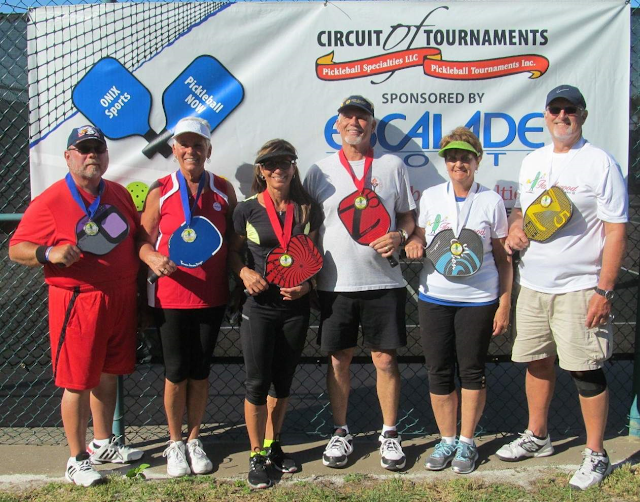 After great play in the men’s and women’s doubles competition, 79 mixed doubles teams took over Tanglewood’s courts on Saturday and Sunday in the fourth annual Winter Classic Pickleball Tournament. Competing in 12 separate age/ability classifications, the players provided some very exciting entertainment for the spectators. In some events, such as the upcoming Heartland Games pickleball tournament, competition is based solely on age. In the Winter Classic, as with many other tournaments, both age and the player’s skill level are considered. Pickleballers are rated from 2.5 to 5.0. The ratings can be based on prior tournament experience or simply a self-rating comparing oneself to a chart of skills. More and more 2.5 level players are stepping forward to test their talent in tournaments each year. By doing so, they are able to improve their play and provide some very exciting matches. As in the doubles competition, locals performed exceedingly well in mixed doubles play. June and John Sproule of Sebring Village took gold at the 2.5 level with Joanne Tripkovic and Larry Colley, also of Sebring Village, taking home silver in the same category. In 3.0 play for those 50 to 59, Tanglewood’s Alisa and John Blackburn earned silver medals. There were so many 3.0 players in the 60 to 69 bracket that they had to be broken into two double elimination groupings. Group A was swept by Tanglewood players. Finishing on top were Sophie Stoneman and Doug Aman. Leslie Ellis and Dan Pilliterri came in second while Marilyn and Glenn Bradley placed third. The B group saw Darlene Powers of Lady Lake partner with Don Crone of Tanglewood to capture gold. The 70 plus age group saw Karen Hensel and John Sonafrank of Lakeside Village in Lake Placid head home with bronze medals. Pickleball tends to be played by older athletes with tennis being favored by more youthful competitors. Occasionally, relative youngsters show up to compete in pickleball tournaments requiring wide ranging age brackets. Such was the case in the 3.5 classification where Tracy Smith and Aart DeVos of Tanglewood walked off with a bronze medal in the 19 to 59 year old category. Barb Danklefsen of Crystal Lake and John Prentice from Sebring Village took silver in the 60 to 69 year old 3.5 bracket while Betty Schleis and Tom Stadler paired up for bronze in the 70-and-over group.